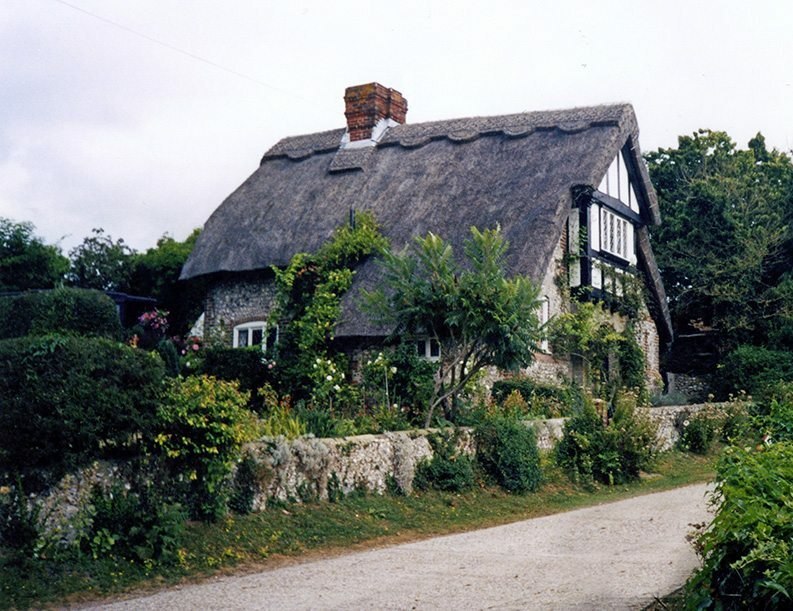 The craft here is not so widespread as in most other south coast counties; but a goodly number of thatched roofs are still to be found. 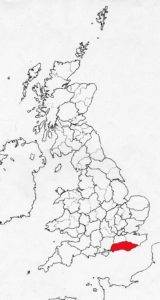 The modern division of West Sussex having four times as many, as it’s sister East Sussex. 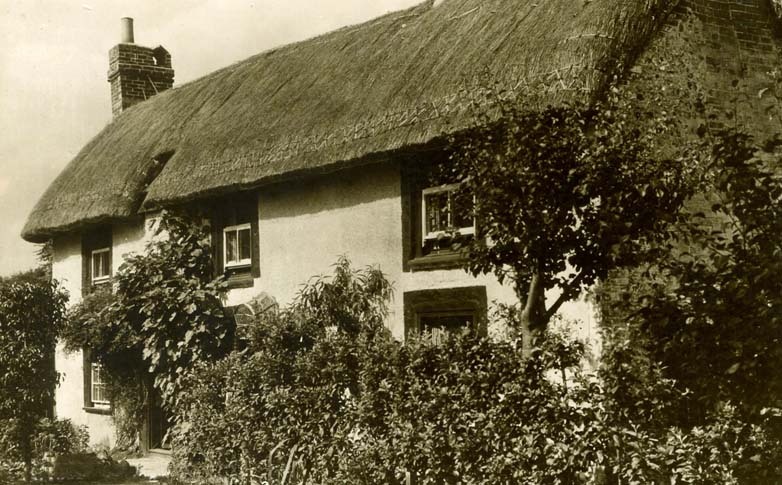 Visionary thatch… At Felpham the thatched home of William Blake, poet and painter, still stands. For a few years, from 1800, he lived and worked here, producing most of his epic poem ‘Milton’; famous today for containing the lines ‘and did those feet in ancient times’ etc. This little drawing comes from the poems illustrated text. 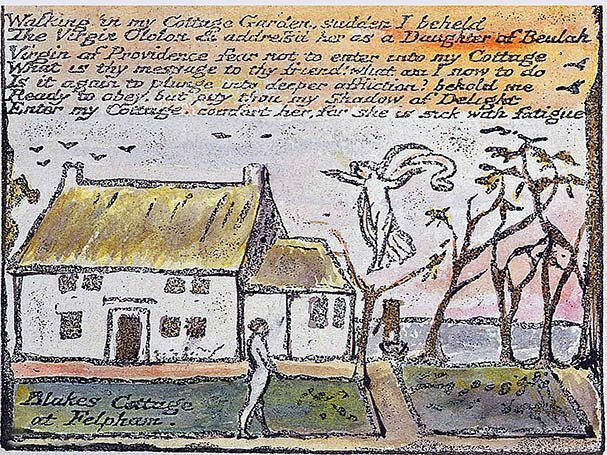 Where William Blake is seen receiving a vision, in his thatched cottage’s garden. More prosaically the same garden saw him in an altercation, with a drunken soldier; with Blake being unsuccessfully tried for sedition, as a result. The long coastline of Sussex still has several marshy river estuaries, which have provided other sources of thatching material in the past. As seen, in the History section, rushes were being used at Pevensey Castle seven centuries ago. Earlier still in 1187, the city of Chichester succumbed to a major fire. As ever, probably exasperated by the number of thatched buildings; roofs here probably being coated with reeds and rushes, harvested at the nearby coast. 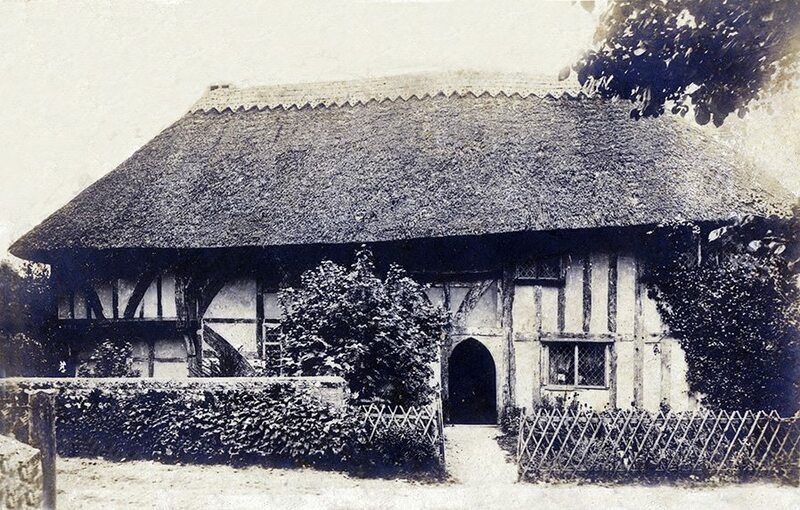 Much later, in 1842; one James Bonniface was thatching ‘at the pad’. This is the site of a well known pub, The Sussex Pad, right on the coast east of Lancing. Whether rushes or water reed were used, his bill doesn’t say. But Mr Bonniface was paid three shillings and sixpence a square, for laying it. And two shillings and sixpence a day for ‘cleaning of reed’. The employer, who lived at nearby Salts Farm, no doubt supplying the material. As in many other parts of Britain, the availability of cheap long straw, that came with mechanised threshing, in the later nineteen hundreds, killed off these local alternative materials. 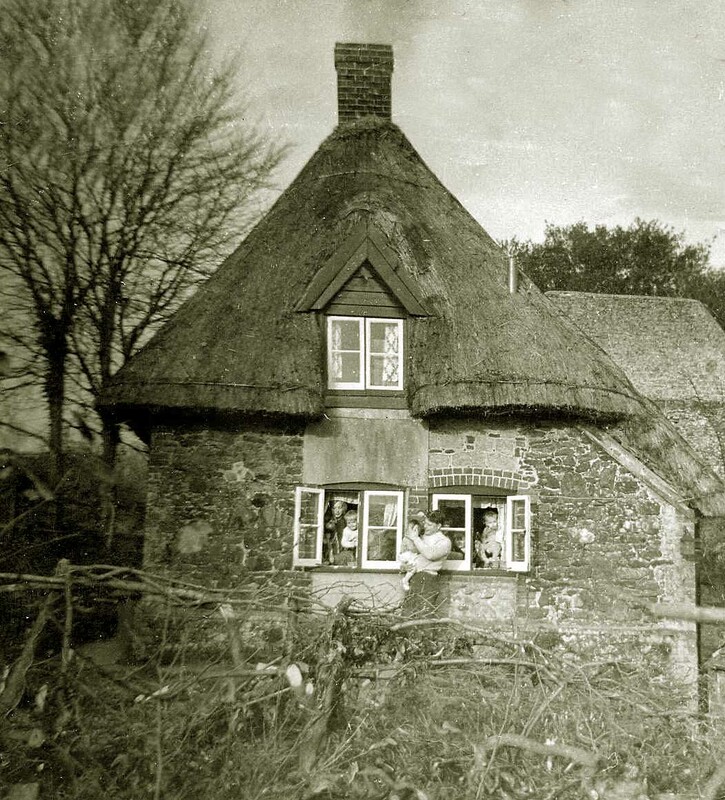 At the Pad… James Bonniface was charging around the same price, for thatching ‘per square’ (i.e.100 sq.feet), as Oxfordshire thatchers were charging a few years before… The building at this time was a favourite haunt of smugglers and was destroyed in a fire, in 1905. A tiled replacement still stands. 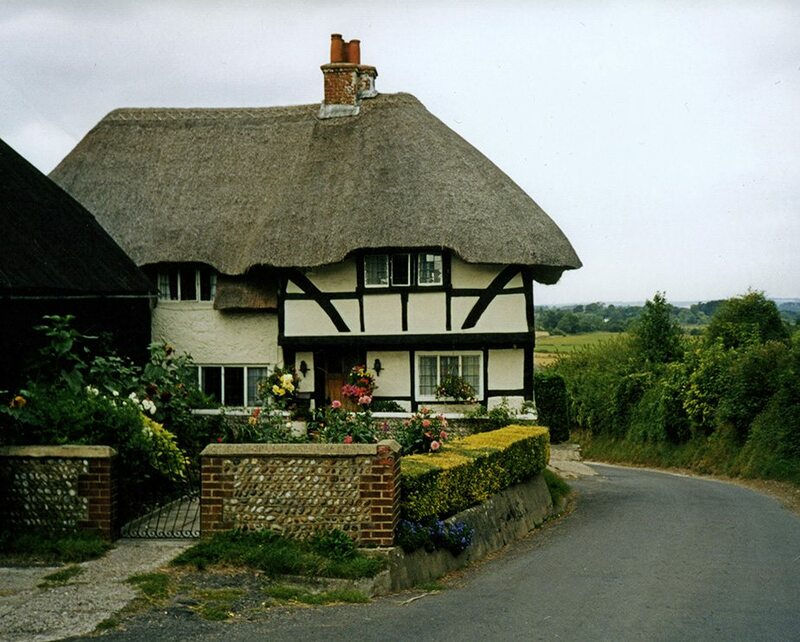 Wayside thatch…The upper thatch at Houghton sits in the Arun valley, an area which contains a great deal of thatching. Nearby lies the large lower roof, at Whepham. showing a square rolled gable end. 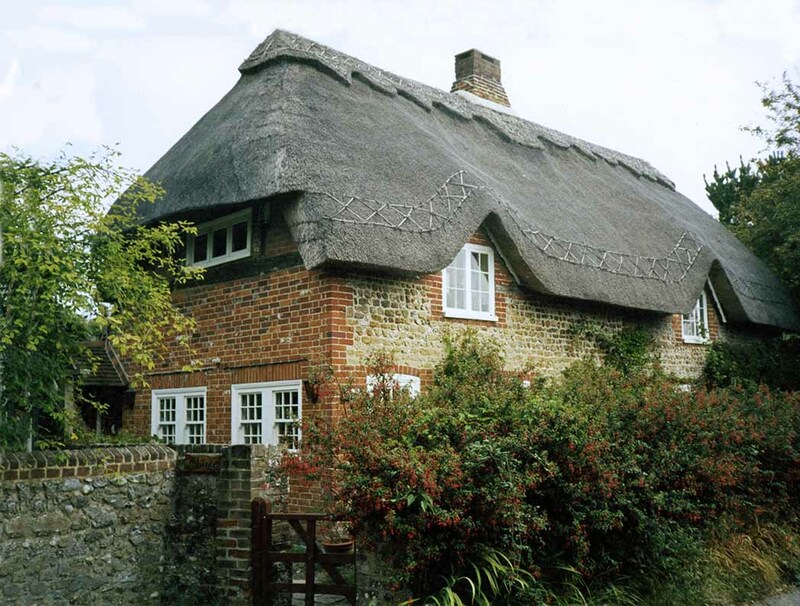 East Sussex thatch… There are fewer thatched buildings in this part of Sussex; the left hand cottage at Alcriston, being an attractive example. 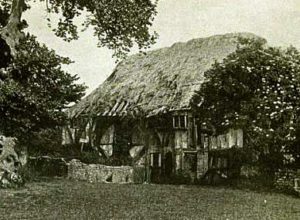 The upper, well thatched long straw roof, at Eridge, with its thick rolled gables, has sadly gone. 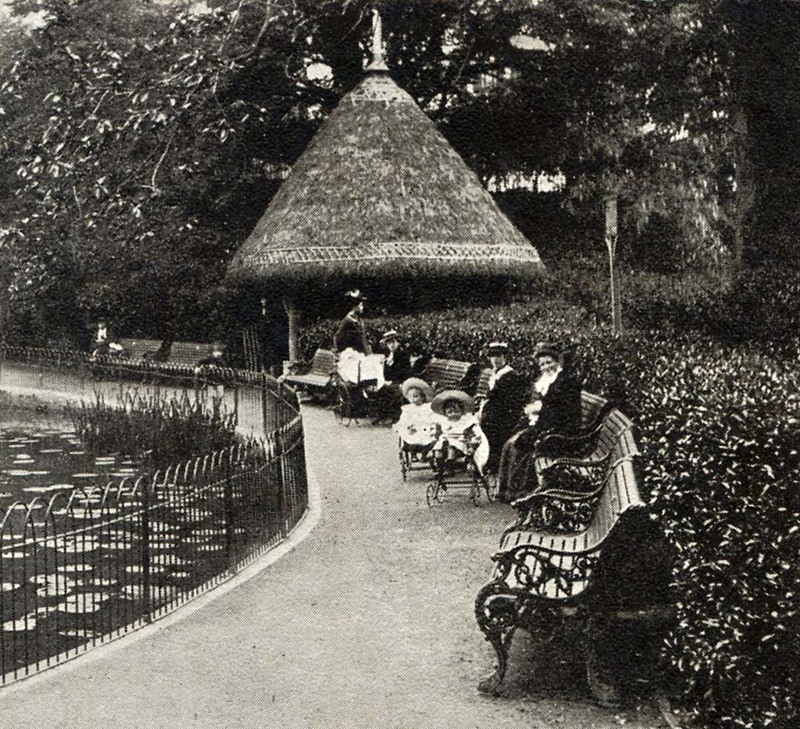 Below is a scene from St Leonard’s Park Hastings, showing a heather coated shelter, a popular thatching material, in around 1900. Coastal thatch… Near the sea, above, at Kingston by Sea. Here the pebbly beach seemingly provided some of this cottage’s building material, three centuries ago. An old timber framed structure, hides under the stone and brick, in the lower cottage, at Sidlesham, near Chichester Harbour. An area with a great deal of thatch. This roof has a long straw sparred edge, but the roof is of combed wheat reed. 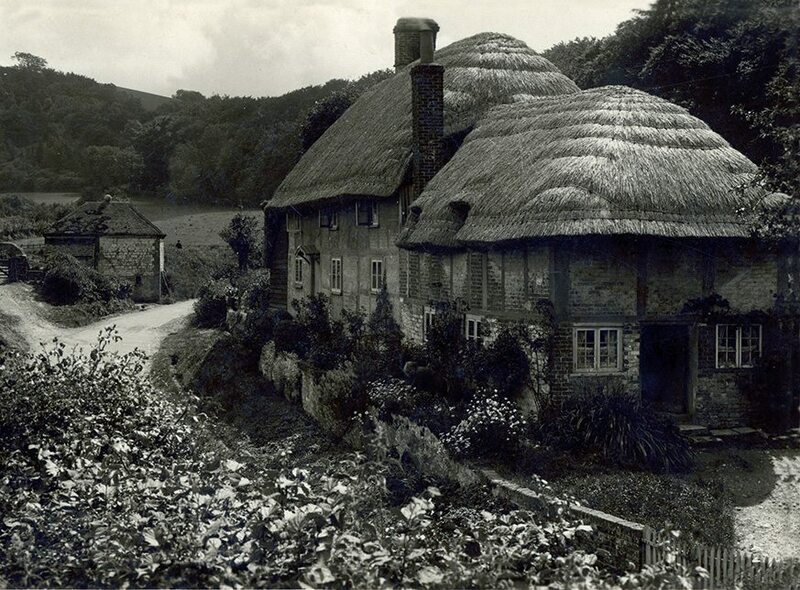 Happy families… A family home, in the early 1960’s, at Nutbourne, near Pulbourgh. A thick multilayered long straw thatch keeps all dry here. Photo courtesy of Frank Riddle. 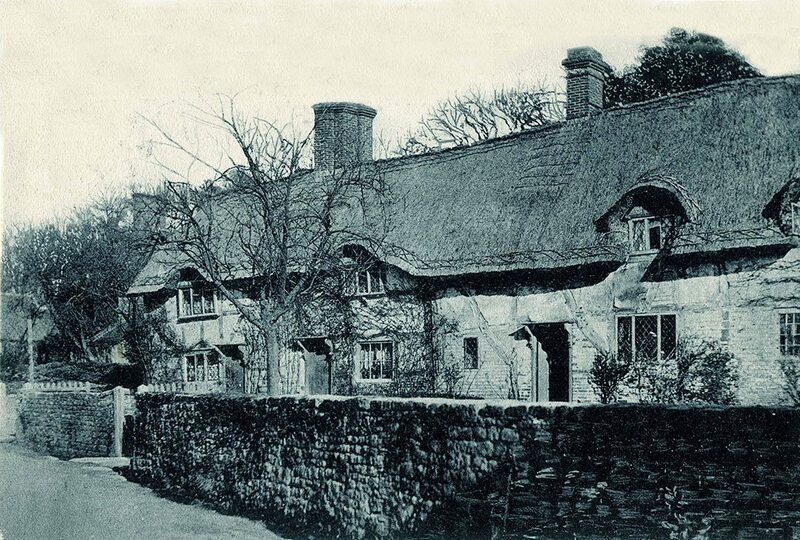 Below is more old Sussex long straw… At Midhurst, on the left, a century ago. 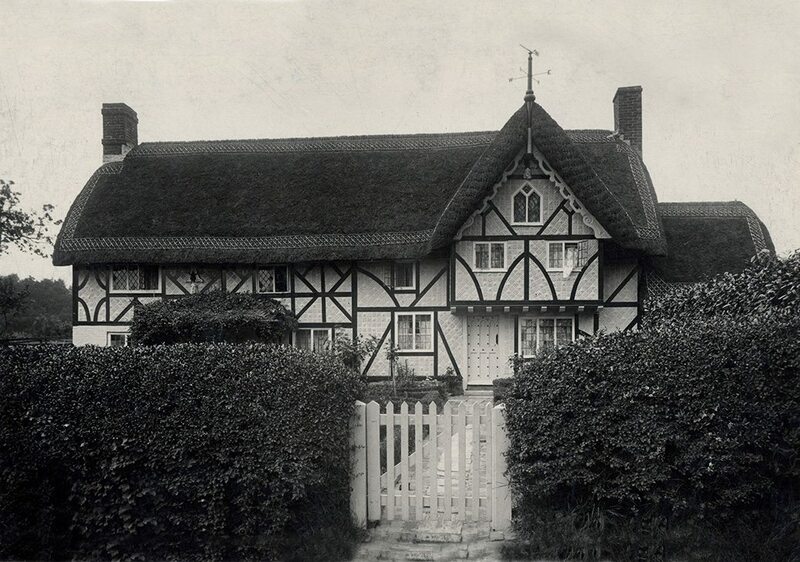 And at Harting, in around 1930. 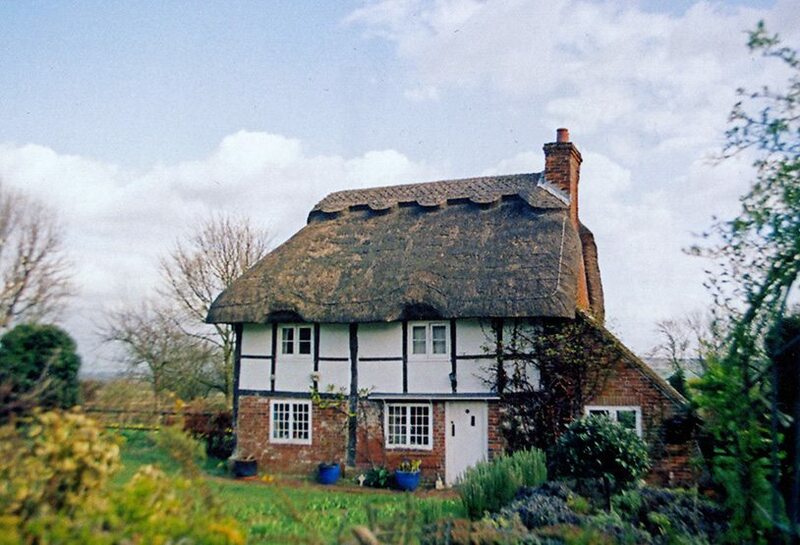 This right hand image shows a very rounded roof. 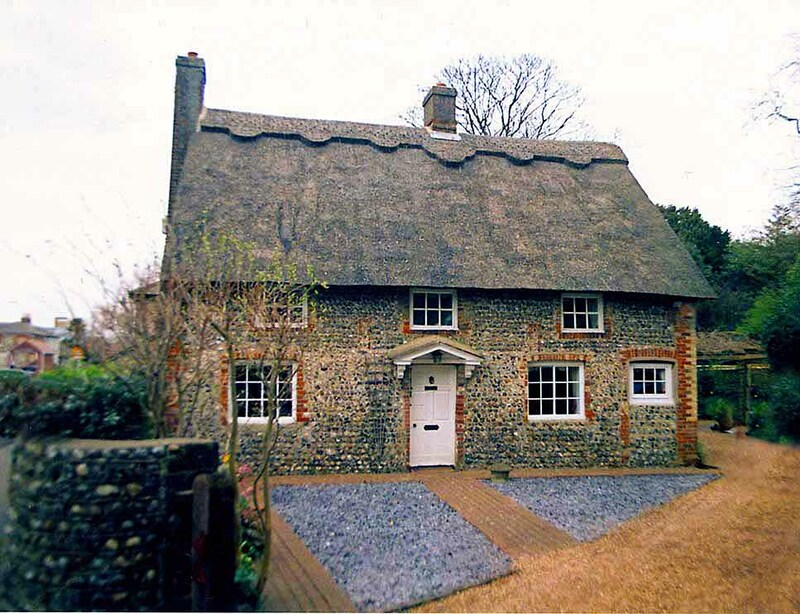 The modern cottage now has a steeper squarer thatch, in combed wheat reed. 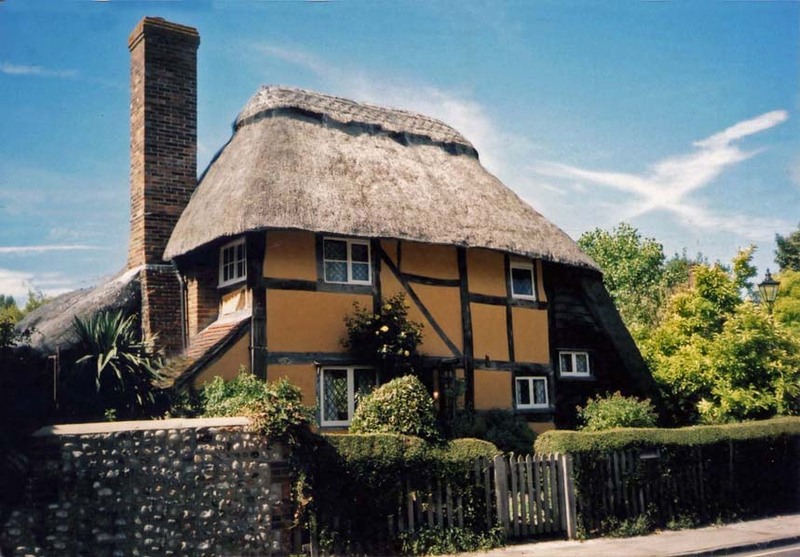 Steyning thatch… This attractive property was once larger and is now just a part, of a medieval timber-framed building. 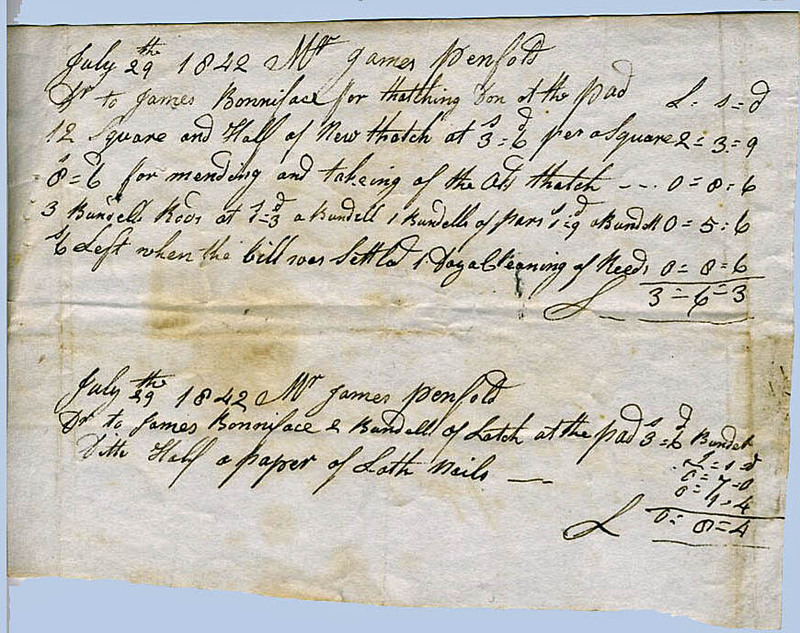 Records of a law suit hereabouts, name some seventeenth century thatchers, who may have worked on this roof… In a case concerning the will of one Thomas Lidbeter, in June 1669, several thatchers gave evidence. Firstly, ‘William Lidbeter, of Steyning, Thatcher, where he had lived all his life and was born.’ He was about 56 years old; and witnessed with his mark. Then, ‘Samuel Cox, of Steyning, Thatcher, where he had lived all his life and was born’. He was about 20 years old and like William could only make his mark. Finally, ‘John Lidbeter, of Steyning, Thatcher, son of William Lidbeter, where he had lived all his life and was born.’ He was about 26 years old, and used his signature, to witness his statement… Whether the deceased Thomas was a thatcher, is not known, but the craft seems to have been a Lidbeter family concern; in Steyning, in the 1660’s. 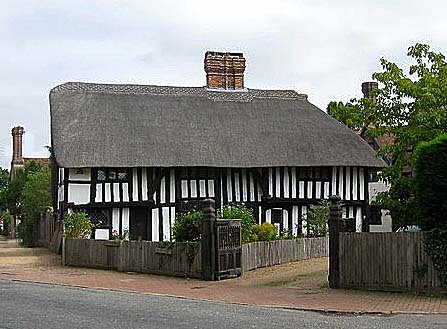 As in Kent, a handful of full sized, medieval, ‘Wealden’ hall houses, have also kept their thatched roofs, in this historic county…. 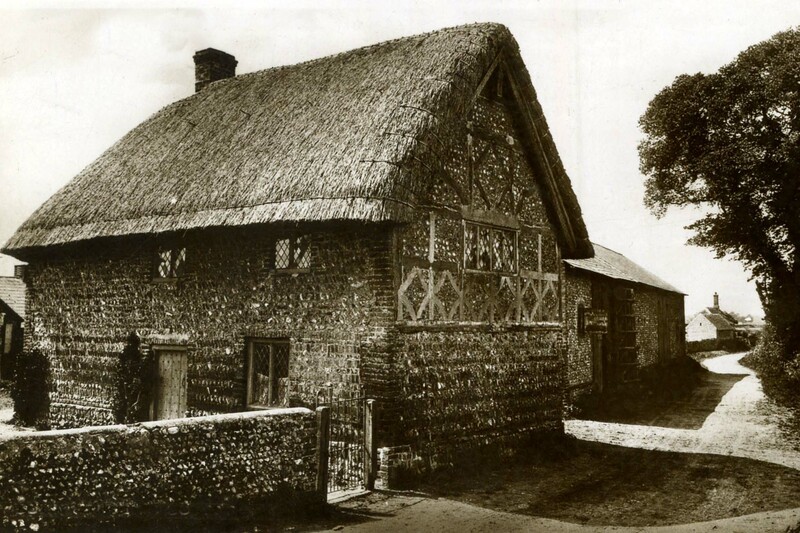 Wealden Thatch…This century old image depicts a rather worn, long straw roof at Bignor. 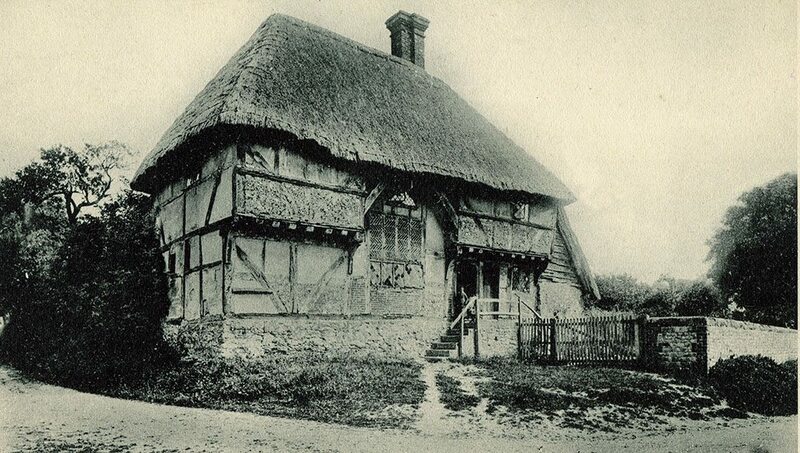 Where this splendid fifteenth century, Wealden hall house still stands. 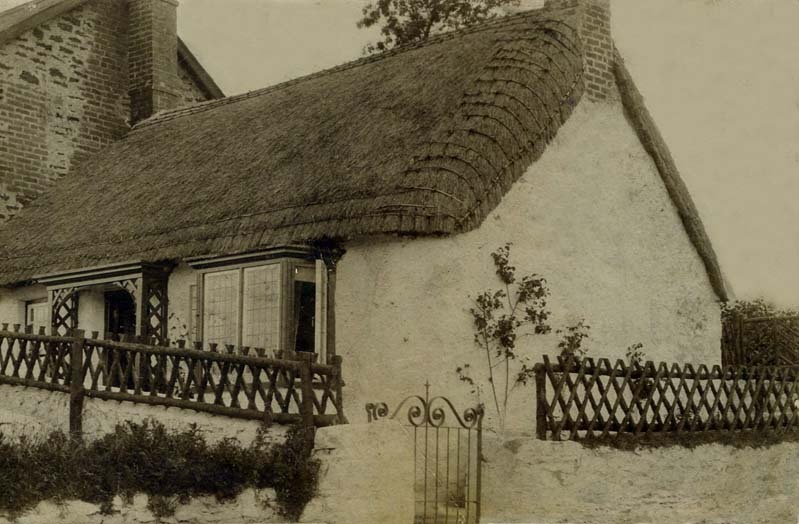 Other thatched examples also lie at Sompting, Bury and as shown on the right,at Lindfield. 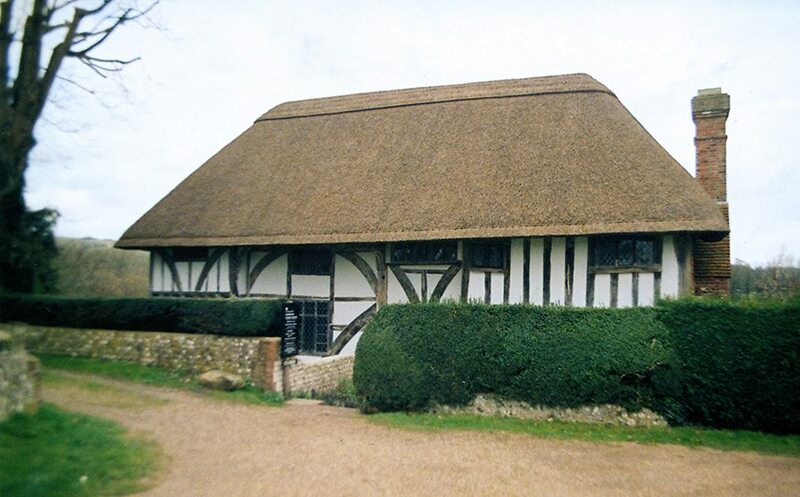 The very first building, saved by the National Trust, was thatched; acquired in 1896, just a year after the Trust was founded… The Trust laid out, the princely sum of ten pounds, for the medieval Clergy House, at Alfriston. Looking at the building, before it’s purchase, some would say they were overcharged!